Advancements in technology are shaping the future of our design and architecture industries. Alongside new sensors, robotics, 3D printing, and synthetic biology, crowdfunding is also transforming the way architecture is designed and created. For those who (somehow) don’t already know, crowdfunding is the practice of funding a project or venture by raising monetary contributions from a large number of people. Most recently, crowdfunding is occurring via the internet using platforms including Kickstarter, Indiegogo, Fundrise, and Fundable. 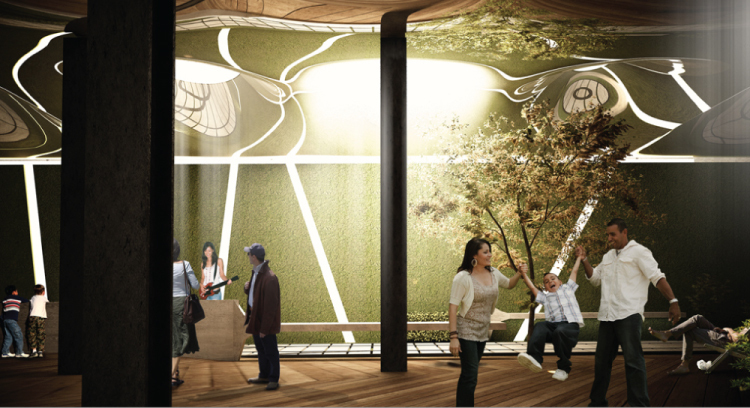 Within the architecture industry, crowdfunding offers a new realm of experimentation; James Ramsey, Principal of RAAD and creator of the Lowline project (the world’s first underground park) utilized Kickstarter in order to establish if their idea might gain traction. And it did — that round of funding allowed for the creation of their conceptual prototype, and the project is due for completion in 2018. Based on this patronage model for a generation of DIY lovers, architects are using innovative platforms and legislation to usher in an era for creative financing. Crowdfunding allows the architect or designer to take a small risk that would normally be considered “high risk” by traditional methods of financing. 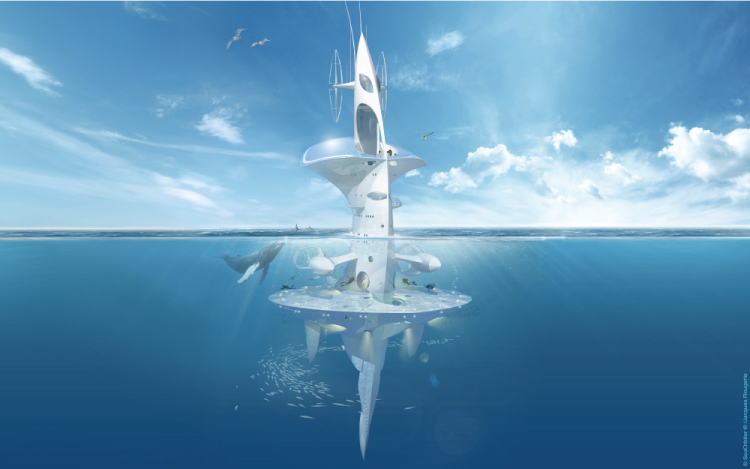 Other incredible projects that owe their successes to crowdfunding include the SeaOrbiter by Jacques Rougerie, a 200-foot-high floating platform for aquatic exploration. €7.5 million was donated via KissKissBankBank. Construction on the project is due to begin this year. Another crowdfunded project proposes public interaction by exploiting the contours of the city: a 300-foot-long slip-n-slide located on Park Street in Bristol, England. Architecture students are also taking advantage of such platforms. For the first time in 155 years, The Cooper Union in New York announced they would be charging tuition fees to students in 2014. To combat this, students launched a One Year Funding campaign, attempting to crowd fund $600, 000 to cover the tuition fees for incoming students in 2014. The premise of crowdfunding is also shifting the real estate industry. Architect Ivan Rijavec coins this as “crowd-housing,” which utilizes the theory of crowdfunding but takes it to the next level by not only allowing the homeowner to facilitate the project but gives them the opportunity to inform the design by establishing the rules and regulations. The homeowner can also inform who can live there and the standards should be. The difference between being a traditional homeowner or a homeowner via “crowd-housing” is you get to have your say during the design process. Alongside a community of like (and not-so-like)-minded people, the crowd-housing homeowner is responsible for formulating, designing, and creating the future building. The primary difference between traditional crowdfunding campaigns is that the crowd-housing homeowner is not funding someone else’s idea, but funding and investing in their own own ideas. Crowd-housing is more of a means of seeking partners rather than donors, and with those partners, work toward the creation of a common goal. On the back of successful crowd funding campaigns, crowd-housing is finally gaining some traction; Citiniche founded by architect Ivan Rijavec is a site dedicated to this pursuit. Via Citiniche, Rijavec has potential homeowners developing the ideas for large-scale communities based on their own preferences (some examples are gay-friendly, pet-friendly, family oriented, and garden-oriented), and other homeowners are either joining in on existing schemes that they like, allowing them to gain momentum, or creating their own to establish something new for the like-minded. The platform allows people to comment and influence anything related to the “niche” from desired location, size and layout, to desired price point for a finished product. The duration of the projects via Citiniche vary but currently two projects are under construction and nearing completion. 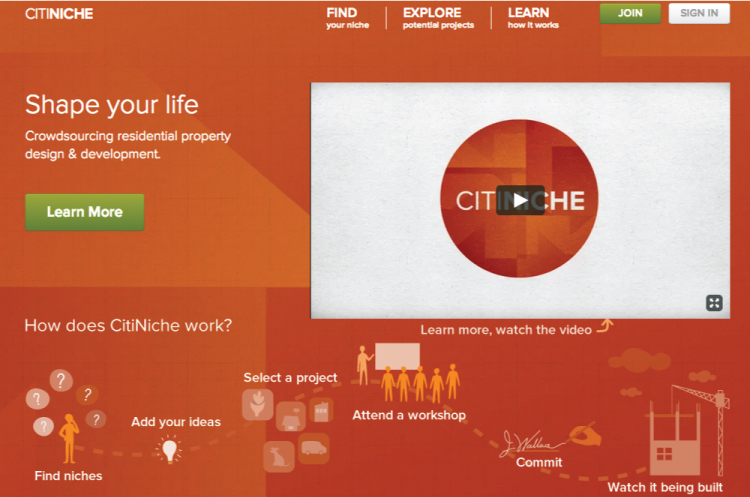 It’s hard to find other sites that do what Citiniche does, though it appears they are at the forefront of something much bigger. The possibilities of crowd-housing are endless and offer many benefits to the architect, owner, and community. Ultimately, it changes the role and relevance of the architect, who functions more as a negotiator rather than master builder. How this will evolve into the future, only time will tell. Crowd-housing raises some important questions for the owner; it’s about challenging the current industry, posing important questions, raising the standard of living, and finding the real you and what you want from life, as well as about finding other people who feel the same.